Kell Brook defeated Frankie Gavin by stoppage in 6th round to defend his IBF Walterweight title for the second time in three months. 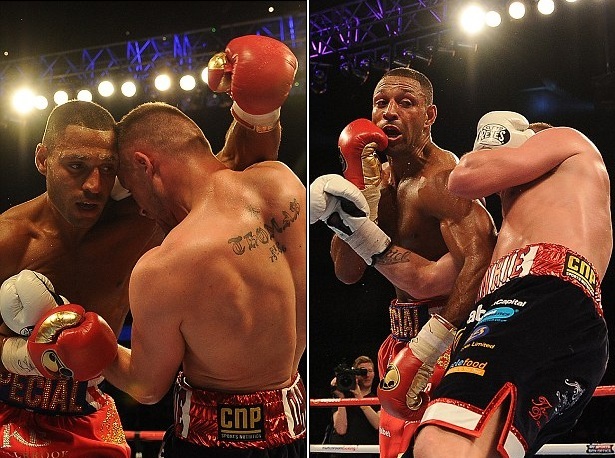 It was a mismatch as Kell Brook looked bigger, faster and way out of league compared to Frankie Gavin who struggled throught the fight until it was stopped by referee. There were couple of other exciting fights on the night where British heavyweight sensation Anthony Joshua finished off his challenger Kevin Johnson in second round with a stoppage. While highlight of the night was Lee Selby who is widely regarded as “Welsh Mayweather” securing another great win. The fight can be bought and seen through Sky Box Office channel in United Kingdom which cost around 17gbp for the entire fight card. Once the fight is over we will be putting highlights and replay videos for the main event as well as other fights on the night. SkySports Box Office PPV present World IBF Walterweight champion Kell Brook defending his title against british fighter Frankie Gavin in the main event headlining some good looking fights on the SKy box office pay per view on saturday night in O2 arena, London. Kell Brook is coming into the fight on the back of a winning a one sided affair against Jo Jo Dans back in March and that was his first fight after he suffered horrific injuries to his leg after he was stabbed in Spain. Frankie Gavin is a decent fighter but he dont have any chance upsetting the odds here, having already lost twice in his last 4 fights its hard to imagine him getting the better of Kell Brook. There are several other quality fights on the night including heavyweight Anthony Joshua taking on Kevin Johnson while Less Selby will take on Evgeny Gradovich for the IBF featherweight championship. Kevin Mitchel will take on Jorge Linares for the WBC lightweight championship title on the undercards. The Sky pay per view gets underway at around 05:00 PM uk time with some preliminary fights while Brook vs Gavin will be starting after 11:00 PM uk time on saturday night.